Swipe your card or log in. Card balance will show. Press OK. 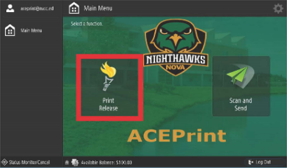 Select Print Release to access your print jobs. 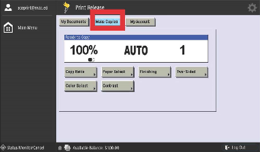 Select a print job and choose one of the following options. Delete, Print or Print All. NOTE: Document will only be saved for 12 hours and then will auto delete. Select Log Out when finished on the lower right of the display. 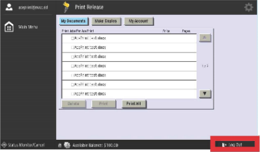 Select Print Release to make copies. Place originals in the feeder on the glass. 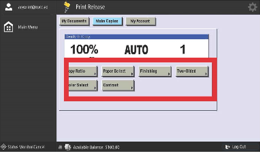 Use keypad to enter the number of copies. Change settings as needed. Press Start to begin copying. 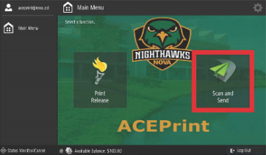 Select Send to Myself to send your document to your NOVA email OR Select New Destination to send via email to one or more recipients. Enter email address(es). Select any of the settings you would like to change. 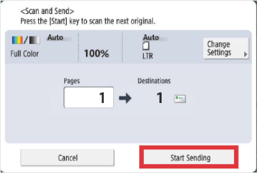 Press Start Sending to send the document.